Taking each day one lesson at a time. I love coffee. I prefer darker roasts. It started when I was pregnant with my 2nd and exhausted all the time. I started getting coffee before work. Then my daughter was born and every time I drank coffee she screamed. Until she was 8 months old. Miraculously after that I was able to start drinking coffee again. I became a bit of a coffee snob – no longer could I drink cheap coffee. Instead, I had to drink top quality. And that hasn’t changed even 7 years later. My favourites are Tofino Roast and North Mountain Roast – interestingly enough from each coast of Canada! 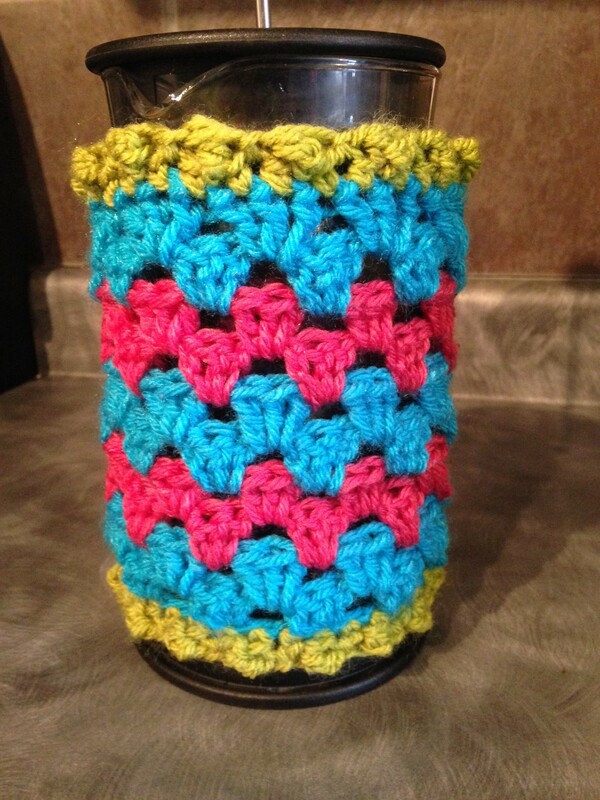 Enter my second obsession – working with yarn. 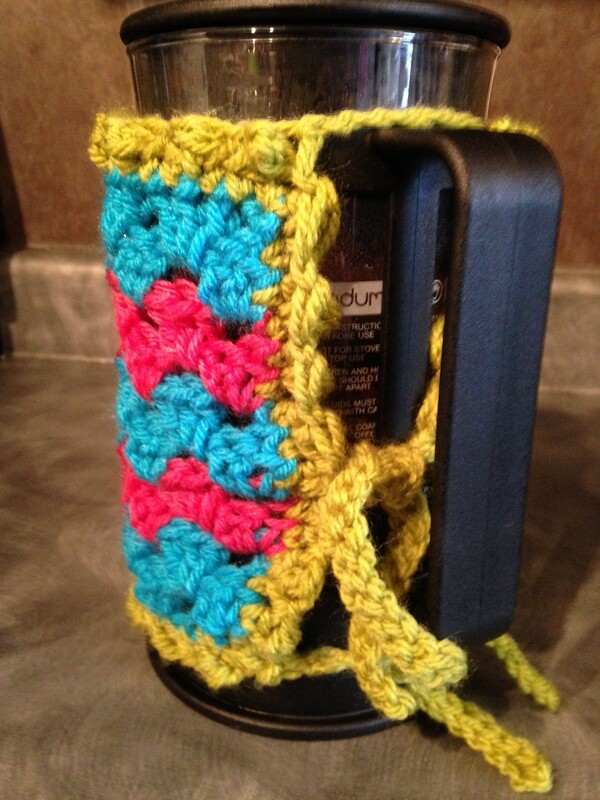 I couldn’t find a coffee cozy that was just right so instead of I made my own. (I’m not type A or anything…) And then I decided to share it with all of you. Worsted weight yarn – about 30-50 yards of each colour. I alternated colours every 2 rows. Row 12: Work the border of your choice. I used this simple border except I used tr stitch instead of dc. 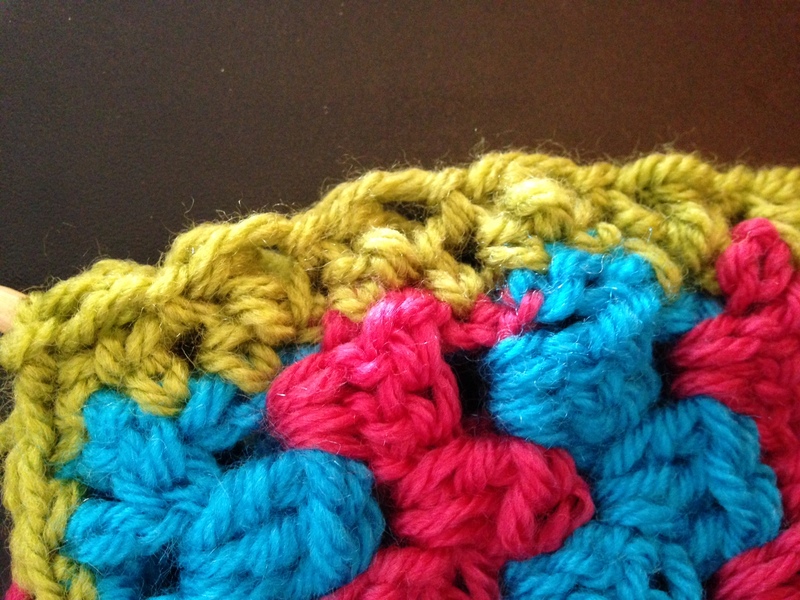 Slip stitch to connect. The treble stitches will be in front. 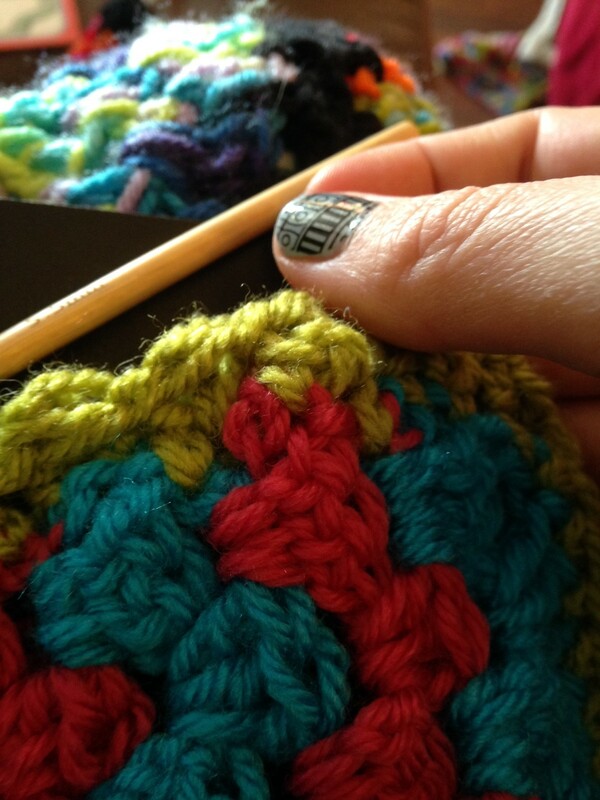 Slide the stitch over towards the back, creating a bit of a puff in the front. 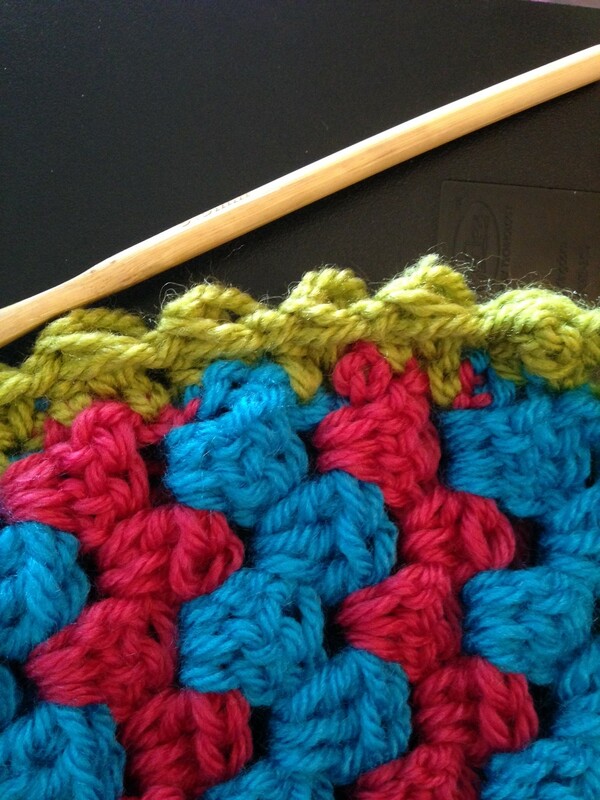 Ch 5 and slip stitch to the opposite corner (this will be the little over hang above the handle). Repeat for another set of ties in the middle if desired. 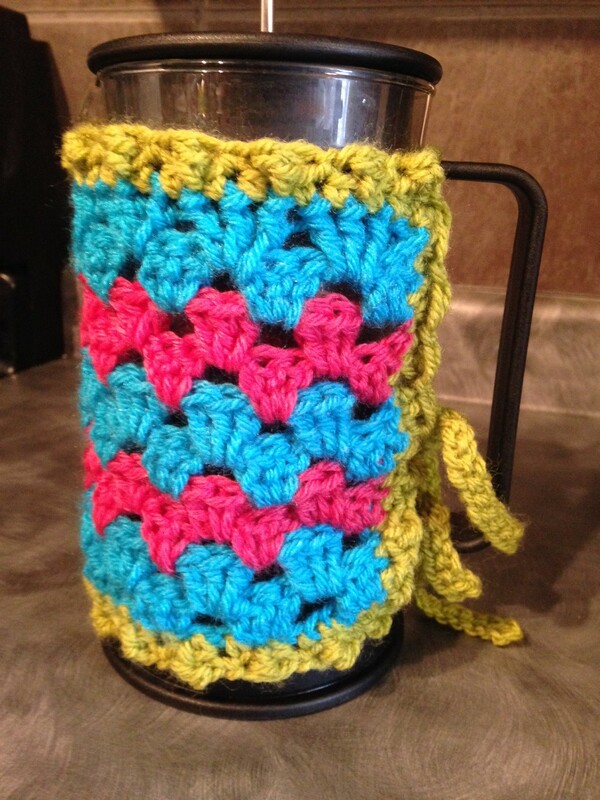 Weave in all the ends, wrap around your French press and enjoy hot coffee! Celiac, Shellfish-allergic, soy-free mama to 2 kids: 1 celiac, soy-free girl (Miss A), and 1 peanut-allergic, celiac boy (Mr Man). Allergy free husband (Chef Husband) that keeps us all sane. Sole goal: keep us healthy.